Description: Protest against recruiters targeting young people for the military on this 16th anniversary of the U.S. invasion of Iraq. We will meet at 26 Federal Plaza, march past several military recruiting offices along Chambers Street, to the Borough of Manhattan Community College (BMCC), where students, many of them economically disadvantaged, are regularly targeted by recruiters to join the armed forces. On the Facebook event page, check “going” if you plan to attend. On October 7, 2001, the U.S. launched a military strike against Afghanistan. Now 17 years later, tens of thousands are dead, even more wounded, millions displaced, and more than $2,400 billion spent, this war — the longest war in U.S. history — shows no sign of ending. Click on image for downloadable call-to-action flyer as 2-up PDF. Assemble at noon for a vigil on this 17th anniversary of the U.S. invasion of Afghanistan, followed by a solemn march to the Times Square military recruiting station for a demonstration against endless wars in Afghanistan, Iraq, Syria, Yemen, northern Africa with U.S. special forces operating secretly in dozens of other countries. If you’re on Facebook, please select “GOING” (if you are) on the event page for the action. Join us as we stand against nuclear weapons on this 73rd anniversary of the U.S. bombing of Hiroshima. On display will be a 20-panel exhibit chronicling the history of the nuclear arms race, the connection with nuclear power, historic demonstrations against nuclear weapons and power, and what can be done to prevent this on-going deadly menace from becoming a worldwide cataclysm. 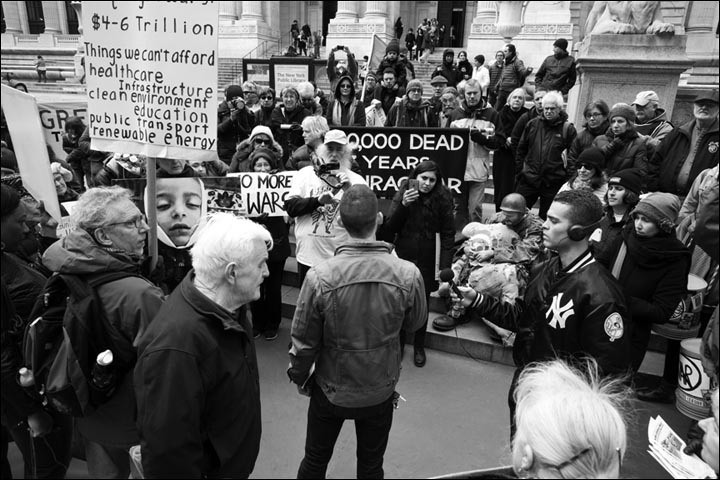 12 to 5 pm: Nuclear Weapons Exhibit and Vigil at Temperance Plaza in Tompkins Square Park, just east of Avenue A and St. Marks Place, in the Lower East Side of Manhattan. Because of the escalating U.S. spending on war and the military — current military spending for $857 billion by the Pentagon and other departments, plus $644 billion continued spending for past wars — we will gather for a picket and vigil at the IRS office (Broadway at Duane) a couple blocks north of City Hall in Manhattan. We will also encourage people to considering refusing to pay these taxes to the Internal Revenue Service and, instead, reroute them to organizations seeking to create a better world for all people. April 14 to May 3 is also part of the international Global Days of Action on Military Spending, organized by Global Campaign on Military Spending and supported by the International Peace Bureau. If you’re on Facebook and can attend the action, please check “going” on our event page. 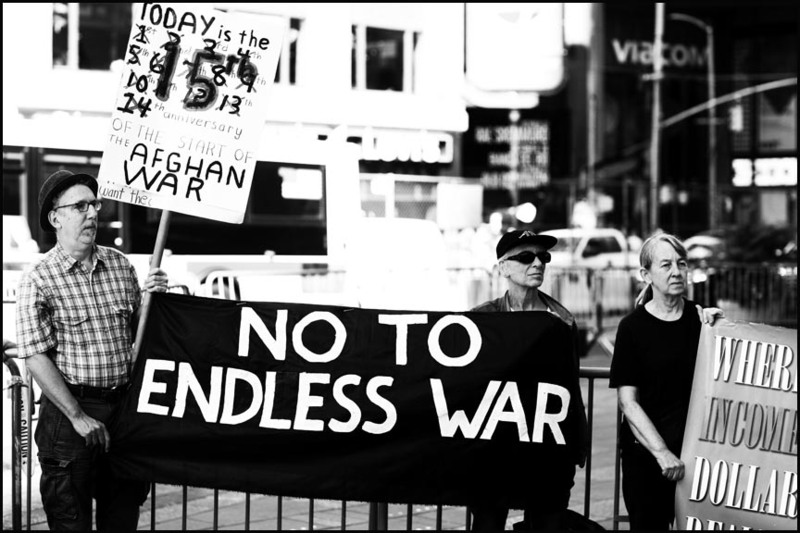 Vigil against this war — now 15 years since the U.S. invasion of Iraq — beginning at 11:30 am, followed by a 12 noon march along 42nd St. to the Times Square military recruiting station (43rd St. and 7th Ave.), where we’ll continue the demonstration until 1 pm. Gather at 11:30 am in Washington Square Park (between the fountain and the arch) for a vigil on this 16th anniversary of the U.S. invasion of Afghanistan, then at 12 noon join a solemn march to Union Square for a demonstration against U.S. war threats to North Korea, and endless wars in Afghanistan, Iraq, Syria, Yemen, among other countries, and the abolition of all nuclear weapons. Click on image above to download a 2-up PDF of the call to action flyer for the event. In mid-June the UN resumes negotiations on a treaty to outlaw all nuclear weapons that began for a week in March. Last fall 123 countries voted for this treaty but the U.S. was among the 38 countries who voted against the ban. 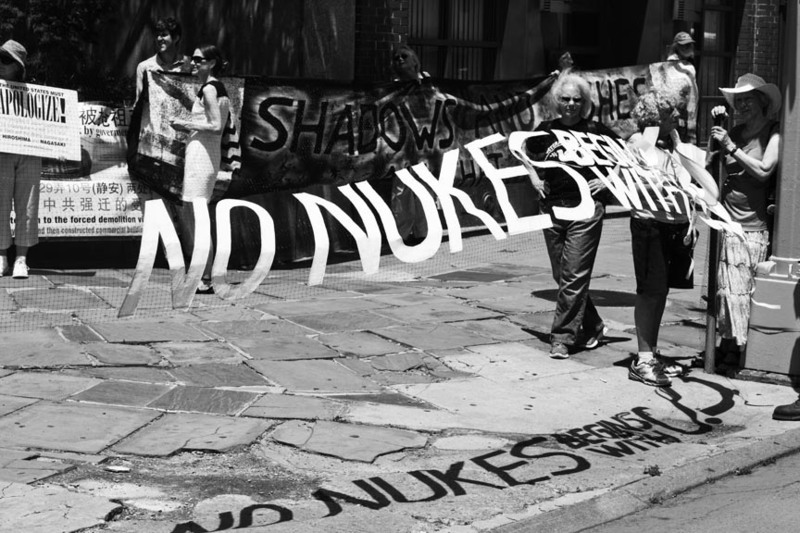 We are organizing a nonviolent direct action to call attention to the dangers of nuclear weapons and to protest the United States blatant refusal to participate in UN negotiations to ban nuclear weapons. We will gather at the Isaiah Wall (First Ave. & 43rd St.), then march two blocks north to block the entrances of the U.S. Mission to the UN (First Ave. & 45th St.). 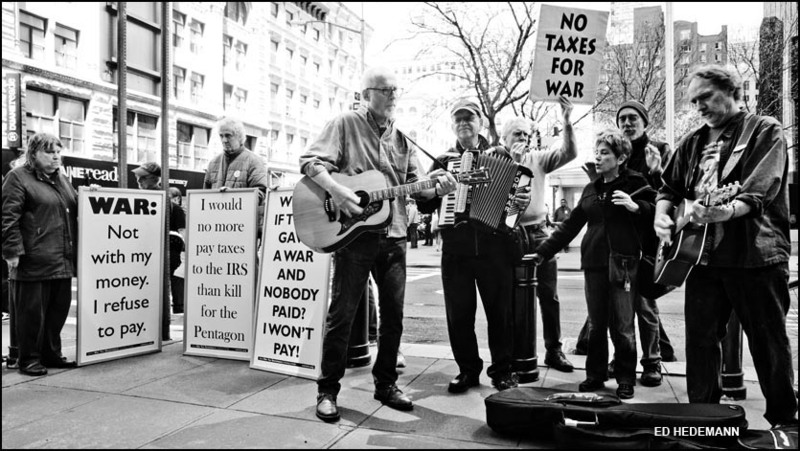 Filthy Rotten System band entertaining demonstrators in front of the IRS, April 18, 2017. Photo by Ed Hedemann. 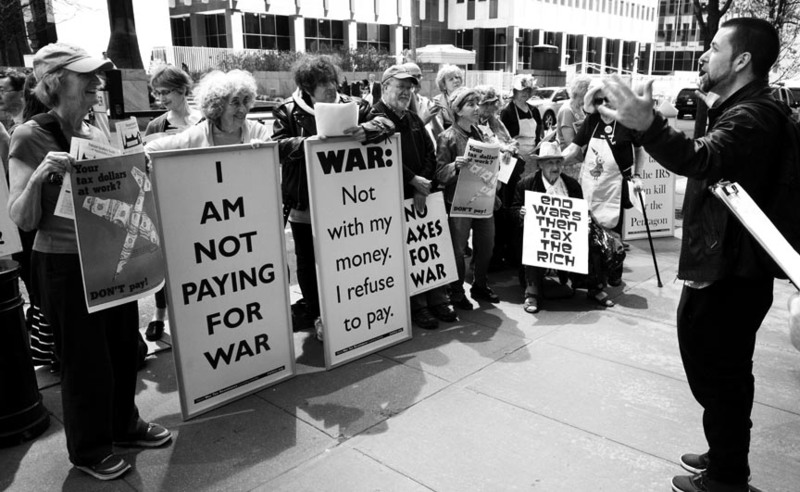 We will gather for a picket and vigil at the IRS offices a couple blocks north of City Hall to protest our tax dollars being spent on all the U.S. wars and the military, and to encourage resistance to paying these taxes to the IRS. To download a 2-up call to action flyer for the demonstration, click on the image to the right. Isaiah Wall, First Ave. & 43rd St.
On March 27 the UN begins a week of negotiations on a treaty to outlaw all nuclear weapons. Last fall 123 countries voted for this treaty but the U.S. was among the 38 countries who voted against the ban. After this week the negotiations resume in June and July. Join us across from the UN as we demand that the U.S. change its vote and — once and for all — lead the way to a world free of nuclear weapons. Sunday, Mar. 19, 2017, noon, NY Public Library (Fifth Ave. & 41 St.) for vigil, then march to Times Square Armed Forces Recruiting Station (Seventh Ave. & 43 St.) for demonstration. Rude Mechanical Orchestra will be joining us! Click image to download a 4-up PDF of the call-to-action flyer. Join us as we stand against nuclear weapons on this 71st anniversary of the U.S. bombing of Hiroshima. On display will be a 20-panel exhibit chronicling the history of the nuclear arms race, the connection with nuclear power, historic demonstrations against nuclear weapons and power, and what can be done to prevent this on-going deadly menace from becoming a worldwide cataclysm. Demonstrators the Isaiah Wall across the street from the UN during Obama’s visit to Hiroshima. Photo by Ed Hedemann. Join us as we stand against nuclear weapons as Obama becomes the first American president to visit Hiroshima. 12 to 1 pm: Vigil across from the United Nations at the Isaiah Wall, 43rd Street and First Avenue, Manhattan. Depending on weather and interest, the demonstration may begin sooner and last longer. Closest subway stop is at “Grand Central Terminal” on the 4, 5, 6, 7, and S trains. Also the M15 bus runs right up First Avenue and the M42 crosstown bus stops a block away at 42nd St. and First Ave. 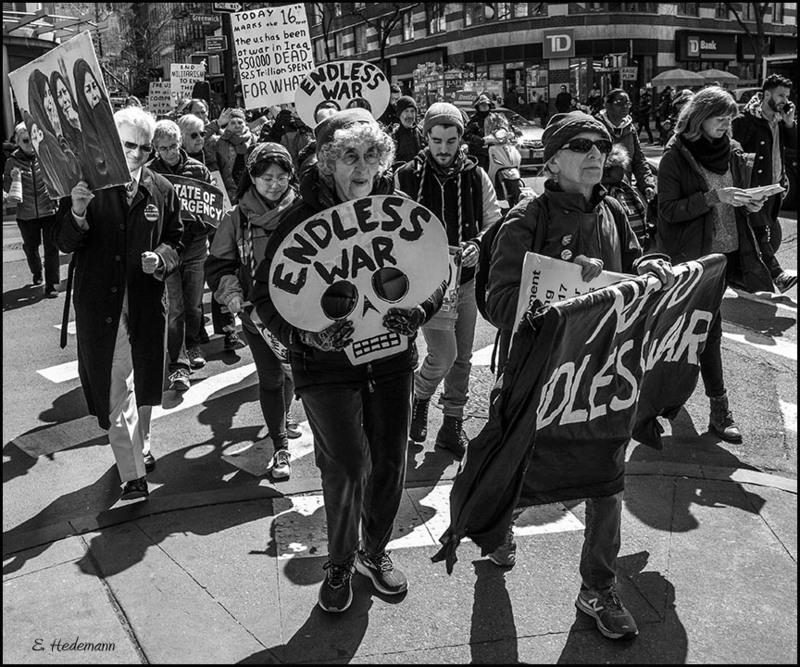 Sponsoring organizations (list in formation): NYC War Resisters League, Brooklyn For Peace, World Can’t Wait, Veterans for Peace/Chapter 34, Pax Christi Metro New York, NYC Granny Peace Brigade, Peace Action NYS, Peace Action Manhattan. Tax Day 2016 (April 18) in front of the IRS at 290 Broadway. Photo by Ed Hedemann. 12 to 1 pm: Vigil in front of the Internal Revenue Service headquarters, 290 Broadway (btwn Reade and Duane Streets) in Manhattan, 2 blocks north of City Hall. Co-sponsored by Granny Peace Brigade, Brooklyn For Peace, and WESPAC. 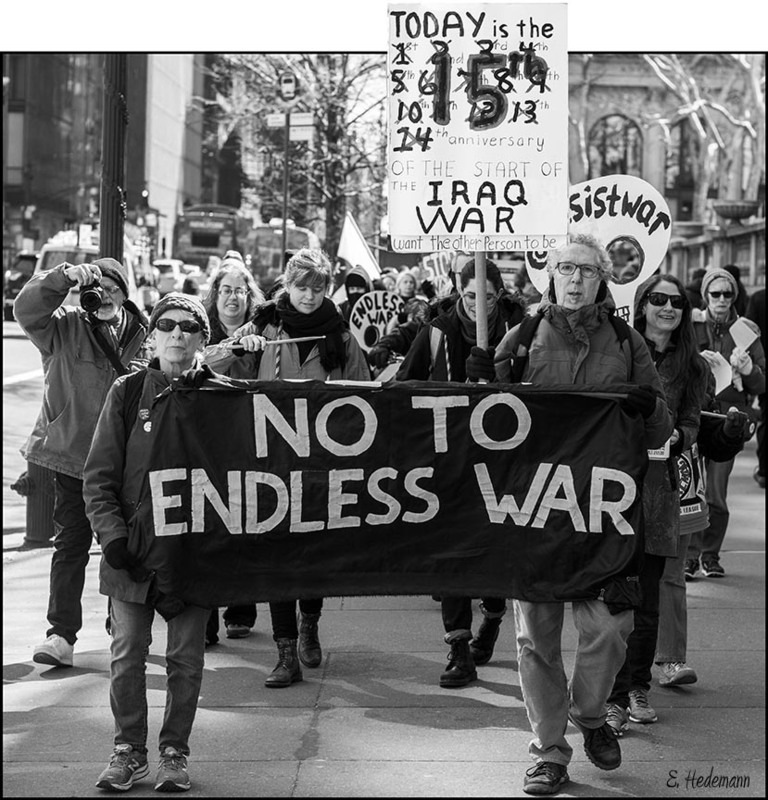 1 pm: Silent march to Times Square Military Recruiting Station (Bwy & 43 St.), where we will vigil, carry signs and banners, coffin, and hand out leaflets calling for an end to the Iraq war as well as the U.S.-initiated wars in Afghanistan, Syria, Yemen, and other countries in the region. 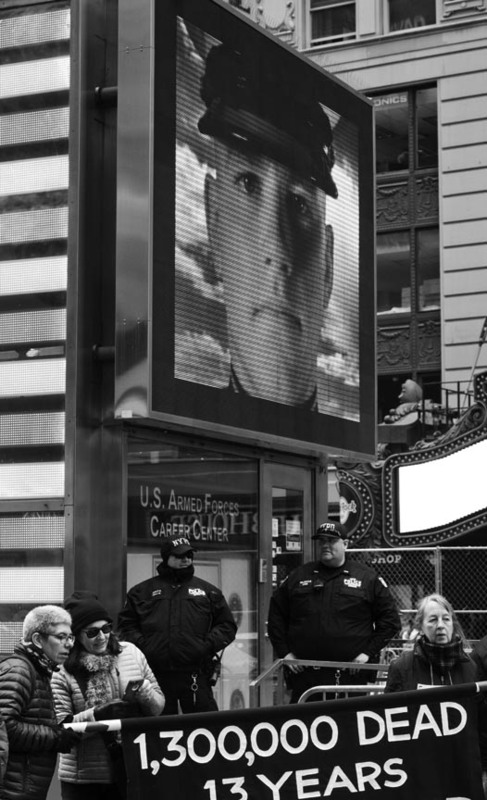 Demonstrators in front of the Times Square military recruiting center, Mar. 19, 2016. Photo by Ed Hedemann. Rally in front of NY Public Library just before marching to Times Square military recruiting station, Mar. 19, 2016. Photo by Ed Hedemann. Click on image (to the right) to download a two-up version of the flyer we handed out during the Mar. 19th action. So far, co-sponsors include NYC War Resisters League, World Can’t Wait, Granny Peace Brigade, Brooklyn For Peace, NYC Metro Raging Grannies, United National Antiwar Coalition, Catholic Worker, Kairos Community, Peace Action/New York State, Pax Christi/NY Metro, Vets for Peace, International Action Center, People’s Climate Movement, MADRE, Peace Action/Manhattan, Long Island Alliance for Peaceful Alternatives, We Will Not Be Silent, North Manhattan Neighbors for Peace and Justice, Washington Heights Women in Black, Washington Heights Counter Recruitment, Iraq Vets Against the War, Green Party of Brooklyn, Lone Wolf Tribe, Iraq Veterans Against the War.